This is a seriously well thought-out bit of kit. 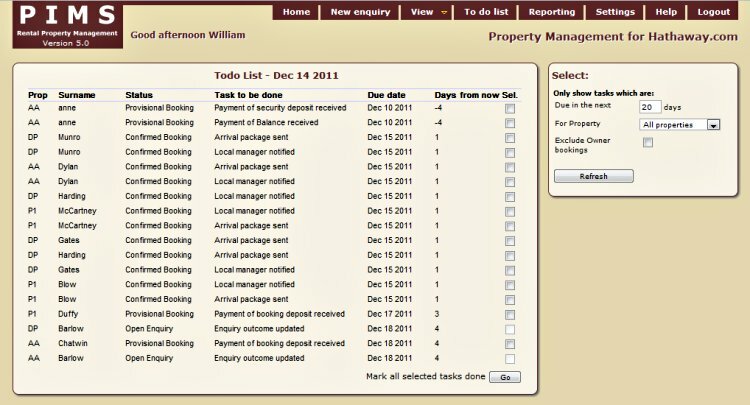 Everything you need,	at your fingertips, to manage your properties. The New Booking Report is brilliant - just what I need. I've been forwarding booking details individually or by spread sheet up to now which is quite time consuming. Thanks for making another task much easier! PIMS was designed by holiday home owners for holiday home owners. As you would expect, it solves the real life problems experienced by owners who may well have other full time employment, but have one or more holiday homes that they rent out to holidaymakers. PIMS for all sizes of business. Holiday rental owners with only one property and very simple requirements will still get much of the full power of PIMS, with our new Lite Version (introduced in November 2010). But if you have multiple properties and want more flexibility and control and also wish to use some of the more powerful capabilities, such as the build-your-own booking form, and whole range of other features, then we offer 3 higher levels of subscription to suit all pockets and requirements. Please see The PIMS Summary Feature List and decide. 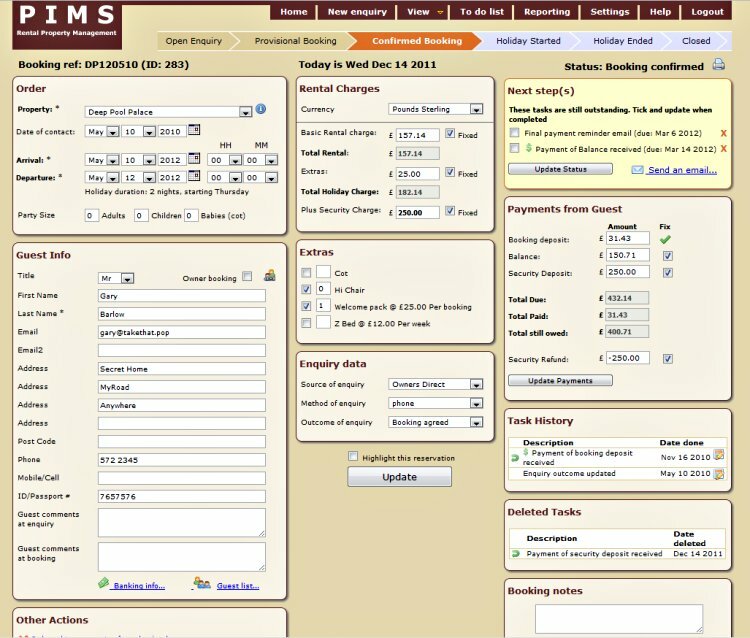 Assuming you have entered all the rules and rates for each property, PIMS will calculate the total cost, cost of extras (if any), the booking deposit fee, balancing charges, security deposit and construct emails with invoicing information. Keep track of all payments made by the guest, when and how much. PIMS will help you calculate the various stage payments according to your own rules, and repost on amounts owing and when. See your bookings, confirmed or awaiting payment. You can take bookings in any currency. You can adjust the conversion rates at any time. When it comes to aggregating the numbers for reporting purposes, PIMS will calculate it all in your master currency for you. Even single property owners will benefit from the many automation features while those with 2 or more properties will find the burden of managing many transactions is significantly reduced. At the heart of PIMS, you will be constantly reminded of the next steps ensuring that guests arrive with all the information they need and you have not forgotten anything along the way. 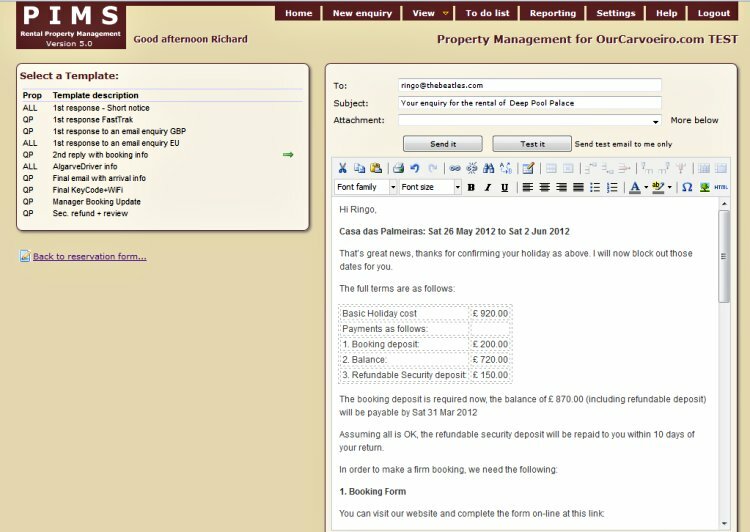 With our new very easy to use email manager, send emails directly from PIMS, using your own customized templates, with auto text insertions so that each email is constructed specifically for the individual guest for each booking. Add attachments to any of your outgoing emails with booking forms, maps, driving instructions or whatever. You can even add an attachment to a standard template, so that whenever you use that template the attachment is automatically included. 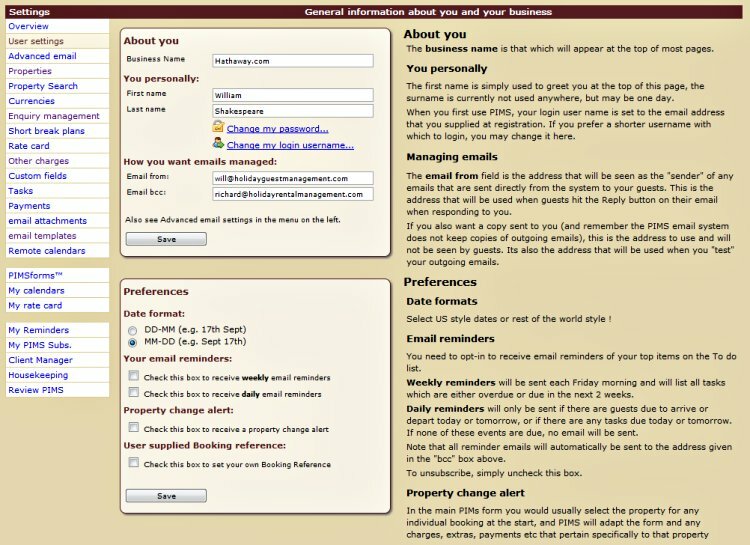 PIMS keeps note of all your guests so that you can identify repeat bookers, save re-entering all their information and if you choose, you can also send emails to past guests depending on any aspect of their previous contact with you. Life is made easier with PIMS when everything you need is on the same screen and you do not need to click in lots of different places to see individual pieces of information about each or all bookings. See all current and future bookings in a neat list. Whether they are confirmed (deposits paid) or just provisional (booking agreed), or just open enquiries, or even holidays in progress you can immediately see the state of your business right there on the opening screen. Compare your calendars for multiple properties at the same time. Or see a full 12 month calendar for any specific property. Scroll forward in time or backwards to see later or past bookings. 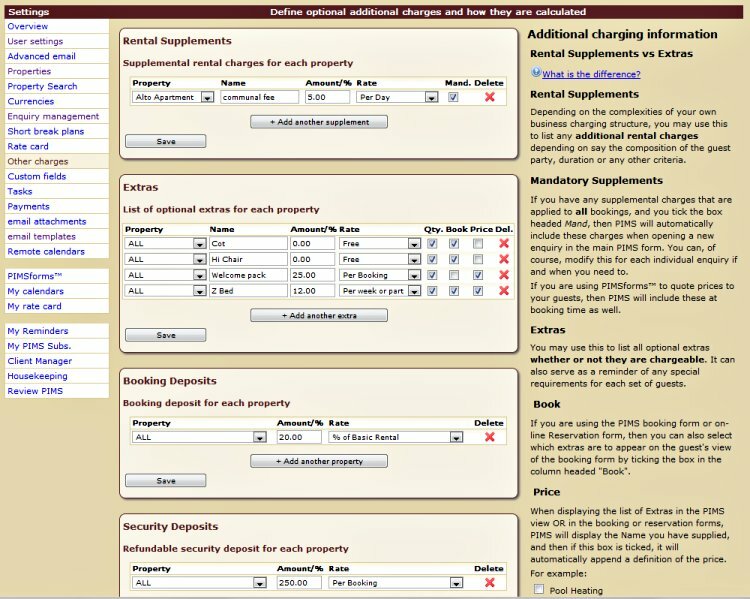 See all the information about an individual booking or enquiry in one screen. Very useful when you're on the phone, or when you need to send additional emails or other communications. Modify any aspects of the reservation (dates, extras, discounts) and watch PIMS recalculate the charges and totals as needed. Easily and instantly review all up coming activities or tasks that will need doing for all bookings or for any single booking. Research has shown that we all choose to run our holiday rental business just a little bit differently. Yes, there's a lot in common, but when choosing a Bookings Management System, you want one that adapts to your way of working. Decide on deposits whether it's a percentage of holiday cost, per booking or even per week. These can vary for each of your properties. 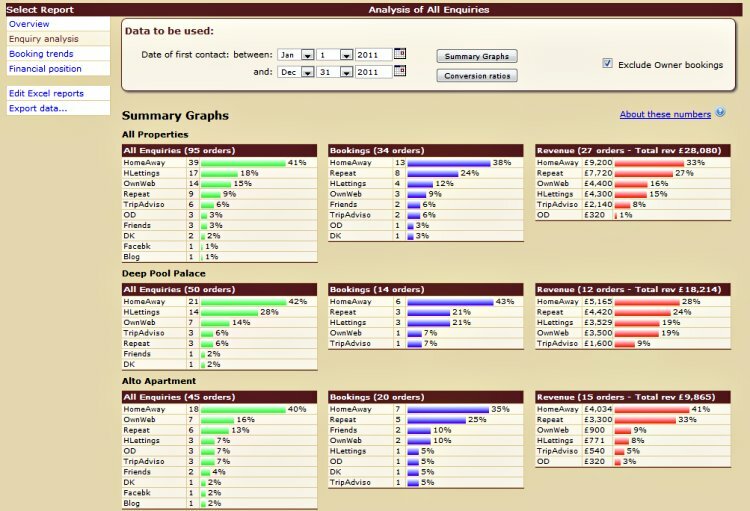 Define your own catalogue of listing sites to track. And many more - including even the ability to choose how to display dates depending on which side of the Atlantic you come from. We're adding new features regularly. Nearly always as a result of user feedback and suggestions. If you are looking for something specific and its not shown in these pages, do ask us.